This graphic shows an approximate representation of coastal areas under a hurricane warning (red), hurricane watch (pink), tropical storm warning (blue) and tropical storm watch (yellow). The orange circle indicates the current position of the center of the tropical cyclone. The black line, when selected, and dots show the National Hurricane Center (NHC) forecast track of the center at the times indicated. The dot indicating the forecast center location will be black if the cyclone is forecast to be tropical and will be white with a black outline if the cyclone is forecast to be extratropical. If only an L is displayed, then the system is forecast to be a remnant low. The letter inside the dot indicates the NHC’s forecast intensity for that time. DISCUSSION AND 48-HOUR OUTLOOK —————————— At 800 AM AST (1200 UTC), the eye of Hurricane Jose was located near latitude 16.1 North, longitude 56.2 West 435 miles away from St. Kitts & Nevis. Jose is moving toward the west-northwest near 16 mph (26 km/h). A slower west-northwestward motion is expected during the next couple of days. 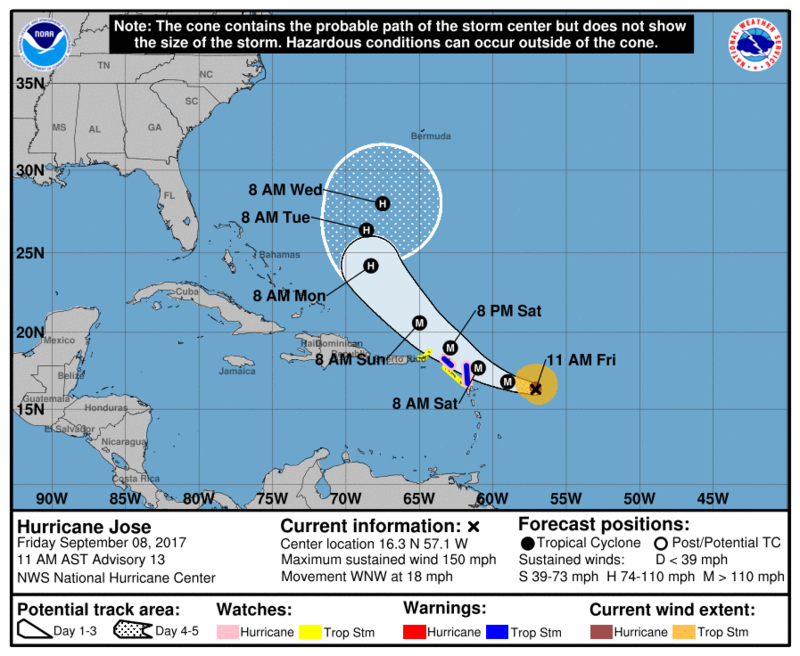 On the forecast track, Jose is expected to be near the northern Leeward Islands on Saturday. Maximum sustained winds are near 125 mph (200 km/h) with higher gusts. Jose is a category 3 hurricane on the Saffir-Simpson Hurricane Wind Scale. Some slight strengthening is possible later today or tonight. The estimated minimum central pressure is 957 mb (28.25 inches). ———————- WIND: Hurricane conditions are possible within the hurricane watch area on Saturday, and tropical storm conditions are expected within the tropical storm warning areas by Saturday morning. Tropical storm conditions are possible in the tropical storm watch areas by Saturday morning. RAINFALL: Jose is expected to produce total rain accumulations of 2 to 6 inches in the Leeward Islands from Dominica to Anguilla. Isolated maximum amounts of 10 inches are possible in the northern Leeward Islands from Antigua and Barbuda to Anguilla. This rainfall will maintain any ongoing flooding and may cause additional life- threatening flooding. SURF: Swells generated by Jose are expected to affect portions of the Leeward Islands by later today. These swells are likely to cause life-threatening surf and rip current conditions. Please consult products from your local weather office. NEXT ADVISORY ————- Next complete advisory at 1100 AM AST.